Honda has announced its partnership with the upcoming James Bond film, Skyfall, and unveiled the actual Honda machines used in the film, at the National Motor Museum in Beaulieu. Honda’s CRF250R motorcycle proved to be the machine of choice by the 007 film’s action vehicles and stunt crew teams. These motorbikes were modified for the opening sequence of the 23rd James Bond film which was shot in Istanbul and Adana, Turkey earlier this year. Twenty CRF250R machines were provided in total, to be adapted and ‘dressed’ appropriately into two native style motorbikes. One is a Turkish police bike that henchman, Patrice (Ola Rapace), seizes after a policeman crashes, the other is a Turkish merchant's bike that James Bond (Daniel Craig) uses to pursue Patrice through the streets. Both bikes feature extensive modifications courtesy of Chris Corbould’s award-winning Special Effects team. Two CRF450R motorbikes were further chosen for use as HD camera filming machines, as only a motorbike could easily enable the camera crew to keep up with the chase scene and follow the various stunts. The Skyfall ‘Police’ and ‘Street Merchant’ bikes, alongside the unmodified and original Honda CRF250R, were unveiled today at the famous National Motor Museum in Beaulieu, which is currently hosting the BOND IN MOTION exhibition until 31 December 2012. The exhibition, the largest of its kind, celebrates 50 years of the James Bond films and showcases 50 of the best-loved and most iconic Bond vehicles. To mark the occasion, Honda (UK) is offering twenty pairs of tickets to the BOND IN MOTION exhibition at Beaulieu, to lucky winners who enter Honda’s exclusive competition on its Twitter feed (@Honda_UK) before midnight on Sunday 22 July. Further activities surrounding Honda (UK)’s association with Skyfall will be announced over the coming months on honda.co.uk, Facebook/HondaCarsUK and Twitter @Honda_UK. 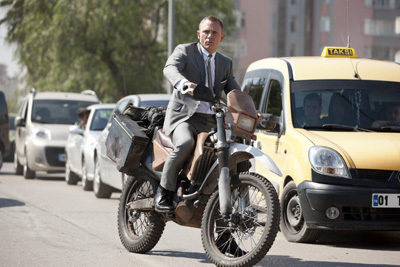 To see the versatile Honda CRF250Rs in action on screen and to enjoy the latest Bond adventure, head to see Skyfall in cinemas from 26 October.